To be honest, I don't usually partake in a cup of coffee, as traditionally I'm a tea man – all I needed was a bag of PG tips to keep me satisfied. But when the Z6 landed in the office and I witnessed my work colleagues flocking to it, I started to wonder what I was missing out on. Then I caught my first whiff of the grind, and I was begging to take this thing home. Looks-wise, the Z6 is a stunning machine, its solid Swiss engineering giving it a premium feel. It isn't exactly small, though, and while it's nowhere near the size of a commercial unit, it still has a significant footprint. Its depth alone made it impractical to set up in my kitchen. Although it doesn't require plumbing into your water supply, you ideally need to keep it close to a sink in order to empty the drip tray easily. The milk system is basically a thermos flask with an adjoining tube that needs to be kept cool when not in use, so having a fridge nearby is also a must. I ended up installing the Z6 in the pantry (yes, I have one of those), next to the fridge. It only took about five minutes, then I fed it coffee beans and added a little water. 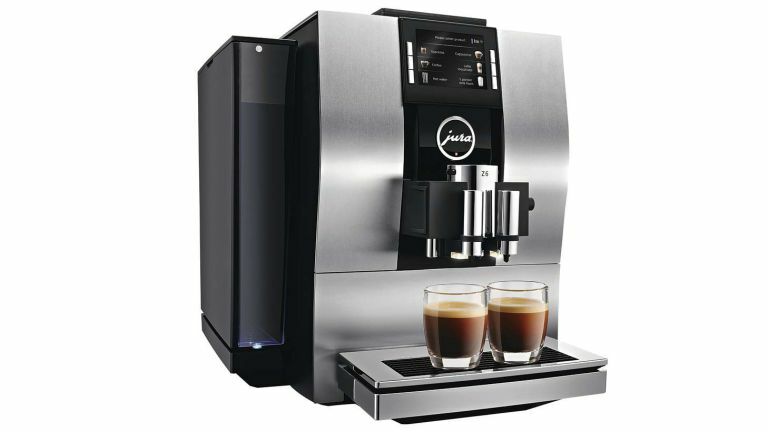 The Z6 will make a range of coffee-shop-calibre drinks – everything from espresso to latte, ristretto to cappuccino. There isn't enough space on the front-mounted display to fit all of them on, but the six slots that are available can be easily swapped in and out, enabling you to create your 'dream' menu. Once you've decided on your six presets, you can 'order' a drink with just a single press of its allocated physical button (there's no touchscreen, sadly). A minute later, you'll be enjoying your beverage of choice. Using the rotary switch on the top of the machine (which resembles an iPod Classic's click wheel), you can customise the default cup/glass size, and also tweak the preset recipes, adding more foam milk, less coffee, etc. This provides ultimate control, enabling you to experiment with your taste preferences. Not feeling particularly adventurous at this point, I started off with a simple latte. The Z6 did a great job of keeping the milk and coffee layered, the supplied glasses adding authenticity. Taking a sip of my first effort, I gave the machine top marks for taste and presentation. The Z6 has an FEA energy rating of 'A' for its class, the system conserving power by shutting down automatically when it's not in use. The machine also gives itself a quick wash and rinse in the process, which is a handy feature. I should point out here that the Z6 requires a fair bit of regular maintenance. Happily, Jura makes this as simple as possible, letting you know what needs to be done via the main display (it uses internal sensors to do this). I only wish it would indicate when supplies are low, as there's nothing worst than waking up in the morning to find you've run out of coffee beans. Not that I'm getting hooked or anything. The Z6 looks stunning when set up at home, and offers coffee variants to suit every preference.